Hooorayyy!!! My exam is over, and let me tell you how I felt immediately after the exam. I felt happy ostensibly like many other friends, but honestly I felt really empty inside, for all in sudden I didn't know what to do after one whole month of nerding, burying myself with notes and past year papers. I actually felt so emo on the day after, thinking hard of what should I do. All in sudden, I thought of playing Texas Hold'Em Poker in Facebook. I bumped into playing poker a week before (just a day after my Economics Paper 4 exam), and I started to learn how to play. But the hard thing comes after learning. Learning how to play poker can be done in less than 10 minutes, but to master it takes a whole life! Just in case you don't know what is poker, poker is a card game that involves betting based on the two cards that you are holding distributed by dealer. You are required to put a blind (minimum stake) into a pot (if you decided to play that hand), and to call/raise/fold it according to your hand strength. The hand strengths include royal flush, straight flush, four of a kind, fullhouse, flush, straight, three of a kind, 2 pairs and one pair (from strong to weak). This might sound easy, but it hasn't taken into consideration the possibility of bluffing. Bluffing means when someone has a weak hand but deliberately raise the stake just to intimidate others, putting pressure on others to fold their cards (some might have stronger hands). I've been playing this game for a week now and went through many dramatic experiences, drawing me to such conclusion that poker has lots to do with luck too, as a beginner. As you gain more and more experiences, you will see a suitable method and stick to it as long as it earns you profit in the long run. It is imperative for us to loss poker chips, just like trading with real money in the financial market. Keep folding is a nice way to minimise losses, but you might miss out some winning opportunities when the turn and river (forth and fifth cards) came out. You might have a straight, or stronger pairs, or flush. I don't know, many possibilities involved; but to be safe, don't ever put hope on turn and river, otherwise it would be considered pure luck if you go for it and win. 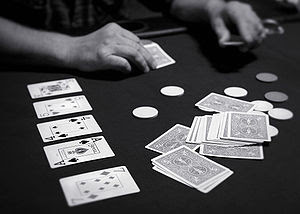 The element of emotions as well play a very huge role in playing poker, that's where psychology comes in. Facial expressions are crucial in real life poker. In short, poker is all about game theory, probability theory and psychology! How interesting it is, right? Am I going to stuck with playing poker for the next 3 months? If you thought so, I'm afraid I have to let you down. Remember I've gotten notes from a senior whom I barely know, on Financial Maths and Actuarial Science? He is a Financial Maths degree student in Heriot-Watt University and he sent me some of his notes in soft copies when I asked for it. So now it's time for me to start reading actuarial materials! Many mathematical topics I don't find it easy to study, so I'm learning one of the topics in CT8 (Financial Economics) now, namely Discrete-time finance and Derivatives Markets. This module involves many new concepts in Finance, not so much on mathematical equations. That's why I can read it in an attempt trying to understand it. =) Wish me luck! Also, I have so many books to read up! Previously I bought many books during book fairs and now I have a whole box of books waiting me to read! Those books cover a myriad of subjects such as finance, trading, economics, psychology, astrophysics & cosmology etc. I don't think I would have time to read every book before flying off, but I know I should at least try to finish a few of them! Now that I have so much time, shouldn't waste the time with unproductive activities, right? I should really appreciate what I have now, acknowledging that I have such a privilege to spend my time doing what I enjoy doing. I wouldn't have such privilege once my university life starts. Next, cooking? I really think I should attend at least a cooking class before flying off! One month cooking class, not bad huh? I should learn how to cook healthy good food, and of course taste plays a very important role too! I emphasize nutrition and taste of the dishes. Art of decorating the dishes? Trivial for now. What is good food in my definition? My definition of good food involves perfect proportion of protein and carbohyrate with a small portion of unsaturated fat. Some oils are actually good for health and do help in losing weight, such as olive oil. That's why I like Spaghetti Aglio e Olio! <3 Should not miss out this very nice dish if you have not already tried.